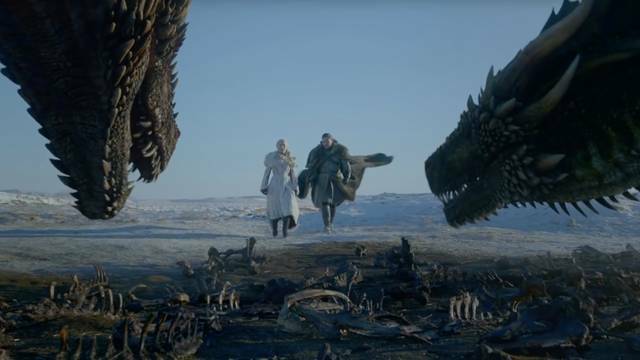 "A solid start to the final season"
A lot of exposition was taken care of in "Winterfell," the premiere of the eighth and final season of HBO's Game of Thrones. We discovered where our remaining characters are (largely either Winterfell or King's Landing, although I'll be sure to take stock of those in other locales later on in the review), we saw many long-awaited for reunions, and we got to witness Jon Snow finally find out the truth about his parentage - and begin to understand that perhaps Daenerys Targaryen might not be the just queen he thought her to be. "Winterfell" is chock full of conversations about trust, which seems like it will be the key currency for these remaining episodes. The people of the North are, as expected, loathe to trust a Targaryen. 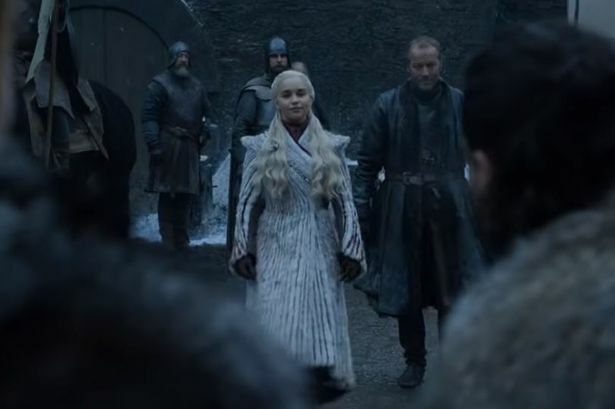 They are also now suspicious of Jon Snow, the man they were willing to rally behind mere weeks ago, but whose own quick trust of Dany makes them question his true loyalty. Sure, some (like little Lyanna Mormont) can be calmed for the moment by a quick speech from Tyrion about the necessity of banding together in the face of the army of the dead. But Jon lost the Glovers by bending the knee, and he wasn't able to save young Lord Umber from the Night King (perhaps if he was governing more and riding dragons less . . .). It's easy to see both sides of the debate. In light of my recent series rewatch, one thing that stood out in sharp relief was that Dany has a penchant for using her dragons to take care of those who might not side with her (as we were reminded this episode with Sam receiving the news that his father and brother were executed on Dany's orders). Jon expressly tells Sansa that Dany "is not like her father," which we've seen isn't necessarily the complete truth. Jon doesn't know Dany, not really. He's advised her not to rely on the power of her dragons, yet she's shown a clear inability to avoid doing so. Sansa's right to question Jon's devotion to her, and Jon is too blinded by lust (or his own Ned Stark-level loyalty, as he really is Ned's son, no matter what genetics may say) to really see it. On the other hand, none of this should matter when there's an army of the dead coming to kill them all. Yet, Dany continues to make plans for when she sits on the Iron Throne, as if that's a foregone conclusion at this point. I suspect something will occur before the massive battle commences that allows other characters to learn of Jon's parentage, particularly since I cannot imagine Jon manages to keep quiet about it (or, perhaps Bran lets it slip, since his idea of a "perfect moment" to tell Jon is right after Sam begins to sour on the idea of Dany as a fair ruler of the Seven Kingdoms). When will Arya and Sansa find out (Arya's quiet plea for Jon to remember that he is their family may mean she knows more than she's let on)? And when will Dany learn that Jon's claim to the Iron Throne is stronger than hers? If Jon has begun to doubt Dany's ability to be the queen he thought she could be, might this be the wedge that destroys their alliance? Or, could the man who has spent seven seasons telling people he didn't want to lead decide he should be king? Of course, all these questions assume that there's still a Westeros left to govern once the Battle of Winterfell is over. And it seems like Cersei is counting on the North to either destroy the Night King or else weaken his army to the point wherein the Golden Company and its 20,000 men (give or take) can clean up whatever (or, should the living prevail, whomever) remains. It's exactly the plan I would expect from her, waiting 'til the odds are (hopefully) in her favor, and then striking. Sure, she had to screw Euron to keep him and his ships around, but at this point, that's a small price to pay for winning the game of thrones once and for all, isn't it? We still, presumably, have one more episode left until the battle of Winterfell commences. Tormund, Edd, Beric, and the remaining members of the Watch are on their way to Winterfell to warn Jon (nice of the writers to ensure we knew how they would be able to overtake the army of the dead and get their first). Theon is en route (although how useful he can be is debatable). Jaimie has arrived and is about to have a long-overdue chat with Bran. Yara is alive and well, holding the Iron Islands, should Team Winterfell need a place to regroup that's closer than Dragonstone (and, you know, should they perhaps need a fleet of ships to challenge Euron in King's Landing in a few weeks). And Cersei lies in wait, ready to fight whatever emerges from the North. The game board is set, and it's time to begin the final moves toward the endgame. -- This was a really funny episode, all things considered. I'm glad to see the show has time to give us some light-hearted fare before the bodies begin to pile up (and we all know they will pile up). -- Remember the trailer for the season, and how everyone was wondering where the various scenes were from? Well, now we know that, save for a few that were clearly from the beginning of the battle, everything was from this episode - including a sad Cersei drinking wine. -- Speaking of Cersei drinking wine, is she really pregnant? -- We found out what Bronn has been up to since leaving the Dragon Pit Meeting: bragging about his dragon marksmanship and sleeping with whores. Interesting that Cersei has tasked him with killing Jaimie and Tyrion, should they survive. Bronn has proven that he's always looking out for himself above everything else (he wants to get that castle and wife, dammit), but he's also proven to have a soft spot for both surviving Lannister sons. This, naturally, assumes Cersei survives long enough for Jaimie or Tyrion to run into Bronn. -- "Winterfell" managed to quash a couple of theories out there going into this season. Theon didn't die saving Yara (it was the easiest rescue the show has ever seen, actually), which only means he'll die in the battle of Winterfell, likely saving Bran or Jon (fitting either way). 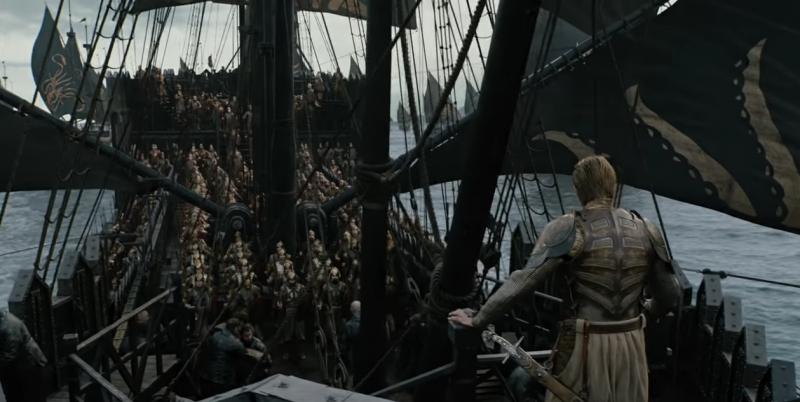 Euron, it appears, kept his word and secured the Golden Company for Cersei rather than betraying her. And Tyrion seems to actually believe that Cersei will send the Lannister army North, as he thinks her pregnancy is reason enough for her to want to help. -- Speaking of Tyrion, man, did he miscalculate if he believes Cersei. Sansa saw right through her ruse and she wasn't even at the meeting. Arya telling Jon that Sansa is the smartest person she has ever met may have been the most important line of the episode - especially since Jon didn't appear to really register what Arya was telling him. After everything she has gone through over the past seven seasons, it's fitting that Sansa has emerged as the one character who can understand what's really at stake with the various political maneuvers happening. Jon and Dany don't have a clue and are far too insular thinkers, while Cersei's vision has narrowed to only focus on her own survival and victory. Assuming they're all alive by the end of episode three, it will be interesting to see how Sansa's ability to read the various parties in play impacts the remaining story. -- Finally, the entire opening credits are new, complete with journey's through Winterfell (including the crypts, where I suspect a lot of things will be happening in the coming episodes) and the Red Keep of King's Landing. Also, some interesting new images on the swords, detailing the key moments of the series up until this point. Pretty snazzy.